Building better experiences is the subject of the discussion at the annual EMEA DoubleClick Leadership Summit that kicked off yesterday at Google’s European headquarters in Dublin. And key to building a better consumer experience is reaching consumers with more precise and relevant marketing. Today we’re excited to announce new DoubleClick precision marketing innovations that allow more relevant marketing for consumers, and that allow marketers to reach and measure their audiences across screens, programmatically, in a brand-safe and verifiable way. Buy app inventory with more control. Building better experiences means, in part, ensuring that your brand is present where and when you intend it to be. We know brand safety and control are important to advertisers, and we continue to develop tools that both safeguard your brand as well as help you reach the most relevant audiences for your message. Understand the impact to your brand across screens. An important part of building better experiences is understanding when users see your ads, wherever they may be. 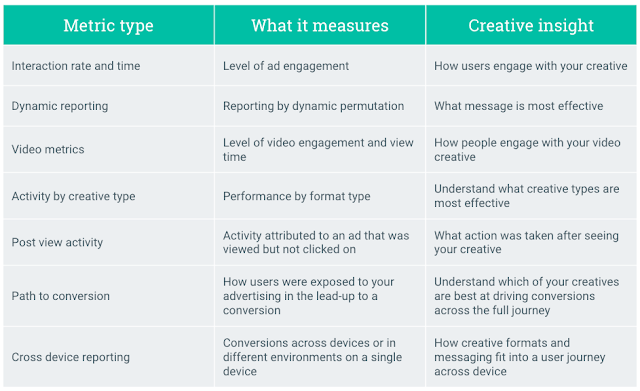 Active View measurement is rolling out for apps in DoubleClick Campaign Manager and DoubleClick Bid Manager, so you can understand when consumers see your app ads. Brands like Bank of Montreal have already seen the benefits of using Active View in DoubleClick to measure viewability across the web, and these insights are now available for display and video app inventory. These innovations help marketers reach consumers with more precise and relevant marketing, enabling better user experiences across all screens for better results. The digital landscape has changed the way people shop for the holidays. With the ability to instantly discover, research and purchase, people around the world are more informed and more efficient than ever before — transforming into supershoppers, seemingly overnight. Supershoppers are a new breed of buyers, keeping their options open and relying heavily on mobile for inspiration, research and e-commerce. They learn the latest brands and the top gifts of the season, and they know where to find the best deals. Where do they gather their knowledge? From you, if you know how to reach them. DoubleClick Ad Exchange offers access to the broadest reach of premium, clean and brand-safe inventory across screens. We've created a new guide to help you get the right message to these supershoppers and to provide some tips to help set your campaigns up for success this holiday season. For guidance and best practices to help your team with this transition, see this Chrome one-sheeter, visit the DoubleClick help center or contact your DoubleClick sales representative. As part of our Advertising Week announcements, we’re introducing new digital innovations to help advertisers close the loop between television and digital, online and offline, and mobile and desktop. Consumers make purchase decisions across many different moments, and over 75% of people1 switch from one device to another while shopping. This makes reaching consumers with the right message — in the right moment — more complex. Today we’re introducing new cross-device capabilities in DoubleClick, including cross-device remarketing, to make it easier to close the loop across screens and reach people where they are, on whatever device they’re using. In July 2015, we introduced the ability to measure cross-device conversions (when a consumer purchase journey starts on one device but is completed on another). These metrics are helping advertisers like American Express and Ringling Bros. better understand consumer behavior and make better decisions about allocating budgets. The insights have proven to be useful, but we’re excited to help you put them into action. Today we are announcing that you can automatically optimize your bids based on how users are interacting with your ads and converting across devices. This capability will be available as an option for automated bidding2 in DoubleClick Bid Manager, helping you to drive greater impact from cross-screen campaigns. As consumers make purchase decisions, they may interact with your business multiple times along the journey. For example, when they’re shopping for their next car, they might download a brochure on their laptop while at work, watch videos while commuting home and read reviews on their tablet on the couch — all before booking a test drive. As an automotive marketer, you could use remarketing to re-engage with consumers who downloaded the brochure and encourage them to book a test drive — but in the past you could only reach them on their laptop. Today we’re announcing cross-device remarketing in DoubleClick Bid Manager, allowing you to reach consumers across all of their devices, in the moments when they’re most receptive and your ads are most relevant. Cross-device remarketing will be rolled out as a beta early next year. You can contact your DoubleClick team to learn more. To reach people in real time across all of the moments that shape their decisions, you need a platform that makes it easier to connect with them on all of their devices. DoubleClick surfaces the right cross-device insights while also allowing you to take the right actions to reach your marketing goals. 2 Only accessible to DoubleClick Bid Manager accounts. Programmatic advertising accounts for 67% of all digital display ad sales1. When you consider that data-driven creative is the creative powerhouse behind programmatic, and that 70% of a media campaign’s performance hinges on the creative2, it’s clear that knowing how to build data-driven creative is a must for any agency with an eye toward the future. As important as data-driven creative is, adopting is easier said than done. That’s why we put together a set of resources to help marketers, media agencies, creative agencies and production teams understand how to connect the dots between data and creative, to build more effective campaigns. We launched our first piece, a guide for marketers, back in March, along with an infographic to illustrate the process. Today, we’re excited to launch a toolkit for creative and production teams, to help you understand how data can fit into your creative process. All eyes will be on Rio de Janeiro from August 5-21 as the world’s top athletes battle for medals in swimming, track and field, gymnastics, basketball, beach volleyball and other popular sports. Millions of sports enthusiasts, families and even non-sports fans across the globe will tap into the excitement of the Summer Olympic Games. With the whole world watching, advertisers have an opportunity to reach Olympics viewers on every screen they use to follow the games. Informed data can help you win during Rio as thousands of athletes compete and billions of people watch. Knowing where viewers spend their time, which sports they follow and what they’re interested in can give you an edge—and wider reach. Check out our Olympics guide to learn how DoubleClick Ad Exchange can help you increase your reach during the games. Digital platforms give brands the tools to reach audiences where they spend their time, at scale and with personalized messaging not possible through other channels—so it’s no surprise that in 2017, total digital ad spending is predicted to surpass TV for the first time.1 With this milestone approaching, we’ve heard your excitement about the opportunities digital can bring to your organization, but also that you’re looking for help to design and implement a digital strategy that meets your unique business needs. Today, we’re launching the DoubleClick Certified Marketing Partner program to help give you the confidence you need to win in digital. Connect with a global network of certified digital marketing experts so you can achieve your goals, from building your brand to driving sales. Certified Marketing Partners provide a range of technology and service offerings. Whether you’re looking for creative or media management services, data or technology integrations, help with measurement and attribution, or access to the DoubleClick Digital Marketing platform, our partners can help you succeed. We’re excited to welcome over 40 Certified Marketing Partners into the program, from around the world. And we’re working hard to build out the program to ensure you can reach your marketing goals by teaming up with a Certified Marketing Partner, no matter where you are. When a partner has the DoubleClick Certified Marketing Partner badge, it means they’ve been carefully vetted and meet our rigorous qualification standards. Partners who’ve earned the badge are listed on DoubleClick Certified Marketing Partner Search, so you can find the right partner for your business. "In the fast-moving and often chaotic world of programmatic advertising, MightyHive has been a trusted partner that we have come to rely upon. In addition to strong strategic advice, we appreciate their product recommendations, campaign execution and intelligence on the latest trends in the marketplace. MightyHive has consistently delivered." “FiveStones brings effective digital strategy and optimization solutions. This partnership has helped us advance our brand marketing strategy and our ability to capitalize on the shift to digital." Mobile is where search starts today for many consumers. Last year for the first time, more Google searches took place on smartphones than on desktops and laptops globally1. Mobile is where consumer micro-moments really thrive: in the I-want-to-know, I-want-to-go, I-want-to-do and I-want-to-buy moments where decisions are made and preferences are shaped. Brands that help consumers in these intent-rich moments will win. To help brands be there and be useful, we're pleased to announce that support for three new mobile tools are in the works for DoubleClick Search users: AdWords expanded text ads, call-only ads and call metrics. Expanded text ads were announced yesterday by Sridhar Ramaswamy, Senior Vice President of Ads and Commerce at Google, during his Google Performance Summit Keynote. They're the biggest change to mobile ad formats since AdWords launched over 15 years ago. Expanded text ads give advertisers improved control over the longer headline field, increased character limits across all text fields, and a simplified display URL workflow. Based on early testing, some advertisers reported increases in clickthrough rates of up to 20% compared to current text ads. Expanded text ads in AdWords provide nearly 50% more ad space, so you can showcase more information about your products and services right on the search results page. Expanded text ads aren't available widely just yet. We’re working with the AdWords team and we plan to have full support quickly once campaign management for expanded text ads becomes publicly available. Campaign management: Expanded text ads won't appear in the DoubleClick Search interface at this time. Bid optimization: Expanded text ads are included in automated bidding for DoubleClick Search for all AdWords beta users. Measuring results: Engine and conversion stats for the expanded text ads will be attributed to the correct keyword in DoubleClick Search. Aggregate reporting (at the ad group level and above) will incorporate stats from expanded text ads. Even if you're not in the AdWords beta, it's a good idea to start planning now for this upgrade. Review Google’s Creatives that Click to learn about best practices. While the mobile web and apps continue to grow, calls remain an important way for consumers to connect with your business. In fact, 33% of mobile searchers have called a business after doing a related search on their smartphones in the past three months2. Today we’re announcing full support for AdWords call-only ads and call metrics in DoubleClick Search. Support for these features starts immediately and you should see them in your account now. Put your business phone number and a "call now" button in your mobile search ads, and more customers will call you directly instead of visiting your web site. Until now, call-only ads were created by selecting a checkbox in call extensions. These new call-only ads replace this option. With call-only ads, you can bid based on the value of a call to your business, and tailor your ads for phone calls to let people know they can reach your business easily without needing to visit your site. And, with call metrics, you can use a Google forwarding number to see how many calls were generated, how long they lasted, and other details that will help you measure the value of phone calls, right in DoubleClick Search. Learn how to create call-only ads in DoubleClick Search in our Help Center, or discover new ways to Drive More Calls to Your Business with Google’s best practices. These three new features are our latest steps toward helping DoubleClick Search customers stay ahead in a mobile-first world. They join other mobile innovations such as cross-device conversions, cross-device bid strategies, and app-install campaigns that help you put your apps in users' hands. We hope they'll help your brand succeed with search in a mobile-first world. Today, we’re excited to introduce an entirely revamped UI for Google Web Designer and responsive design capabilities that help creative developers make true responsive ad units a reality. We’ve given the UI a Material Design-inspired makeover, to make it easier and sleeker for you to use. Re-order and move the panes on the right for Color, Library and Components panels as easily as you do for your browser tabs. You can separate them into panels of their own, or combine them onto one panel. Choose from a number of popular key mappings (keyboard keys mapped to on-screen functions) to make code view even easier to use. Set default text styles (font, size, color) and apply them throughout a single document and across documents. Save these stylistic preferences for next time. When you log in again, the tool will remember your last-saved customizations. Bonus: When you add a component to your stage, you can preview it with the actual asset, instead of as a gray “placeholder” box. This way, you get a better sense for how your creative will actually look. 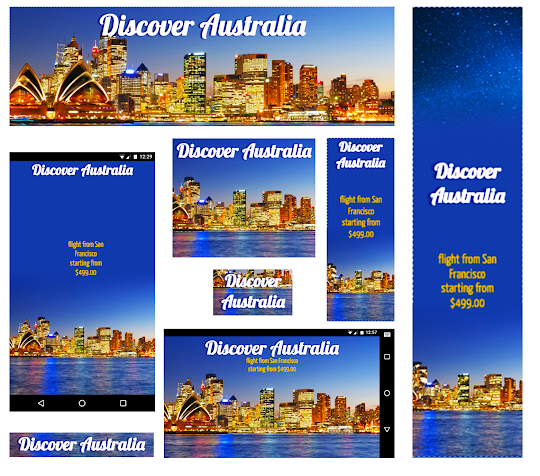 Media rules help you build a single ad unit that can change its layout based on the height and width of the screen it shows up on. The easy-to-use interface creates color-coded ranges of ad sizes (see the red, yellow and purple bars along the top of the gif below and the blue and green bars along the left). You can build rules into your ad unit around which creative assets and layouts should show up for each size range. For example, say you want to build an ad that can work in a large full screen space on a mobile phone, in a regular 300x250 space on a desktop, and in a small 300x50 space. You can build a single ad unit, then define the styling and layout the ad unit should use for each size. So when the ad renders on a screen, it recognizes the size and renders the correct styling and layout for that size. Of course, this works on a sliding scale, so all sizes in between the cut-off points will render appropriately as well. Learn more. 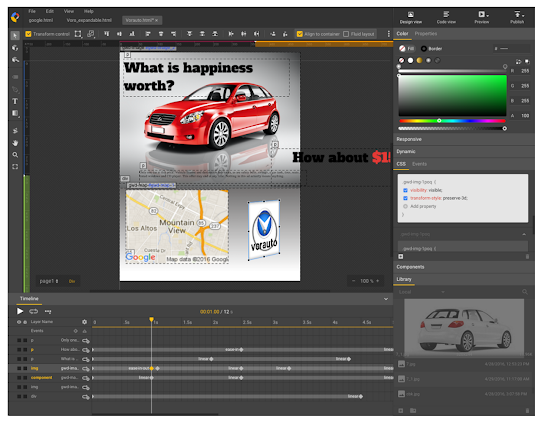 We’re really excited to bring this new and improved Google Web Designer to creative developers. We hope the responsive design capabilities help you create ads for multiple sizes more easily, so you can bring your experiences to life across screens. Our training and engineering teams are hosting a hangout on air on May 26 @ 12pm ET to walk through these features in more details. RSVP here. As a reminder, if you’ve already downloaded Google Web Designer, it will automatically update to reflect these new features. If you haven’t yet downloaded the tool, you can download it for free here. Cross-post from the Google Analytics blog. Analytics 360, part of the Google Analytics 360 Suite, is proud to provide this type of end-to-end understanding with our existing AdWords integrations. Beginning today, we are now offering this same capability with the DoubleClick Digital Marketing platform. In addition to our existing integration with DoubleClick Campaign Manager*, you can now view user engagement information for users acquired through DoubleClick Bid Manager* and DoubleClick Search* campaigns directly within Analytics 360. It’s super easy to connect your Analytics 360 account to DoubleClick Digital Marketing and there’s no implementation work needed (e.g. no site or campaign re-tagging). You are launching a new product and start running display and search advertising campaigns to attract customers. You find that one campaign has a low conversion rate and you’re considering deprecating it. But you review your site analytics data for this campaign and find that some specific ad exchanges and certain keywords are driving many new users to your site. And some of these exchanges and keywords are driving new users who are highly engaged — they view a lot of product detail pages and spend a lot of time on your site. So, instead of shutting down the campaign, you refine the targeting for the ads in this campaign to focus more on the ad exchanges and the keywords that drive engaged new users to your site. Then, you create a remarketing campaign to bring these engaged new users back to your site for purchase. These are just a few examples of how analytics data can blend with campaign data to create real value for both companies and for their customers. It's a win-win — customers get marketing that is truly relevant to them, and companies put their marketing dollars to work with the customers who are most likely to be interested. *Note: Must be a Google Analytics 360 customer to view these links. This is part four of a five-part series introducing the creative process for data-driven campaigns as outlined in our new guide: The Creative Process for Programmatic: A Guide for Marketers. Broadway shows have done it for decades. Bars and restaurants have been doing it for years. More recently, retailers have gotten on board—and now, smart brands are using the soft launch approach when mounting data-driven advertising campaigns. Thanks to the sophistication of digital media buys, the soft launch is now not only possible, but recommended. Digital — and, particularly, programmatic—allows your campaign to “sneak” out into the real world, where your team can review it in its live environment before launching in full force. As part of our recent study of best practices for data-driven creative campaigns, we found that soft launches can save significant time, money, and hassle for marketers and their creative, media, and production teams. Make sure that all of your platforms are integrating. If you’re not using an end-to-end solution, make sure that your buy-side, sell-side, and creative platforms are integrating correctly and not interfering with each other, as this may affect how ads are served. Review how the creative looks in context. No matter how carefully you craft your creative template and variables, your work may look different once it’s live. Make sure everything is lining up properly and rendering correctly—and as long as you’re at it, give the copy one more solid proofread. Ensure that the correct metrics are tracking. Have your media agency pull reports at both the campaign level and the dynamic creative level. This will give you a birdseye view of your campaign, as well as a sense of which dynamic elements are performing best and should be optimized. Once you’ve evaluated your campaign in a real-world context, you can ratchet your budget up to your desired daily spend. When should you do a soft launch? Collaborated on an all-hands kick-off. Before moving on to the soft launch, your team will also traffic the campaign and conduct a cross-agency QA. To learn more best practices for trafficking and QA’ing data-driven campaigns, as well as see examples of real campaigns in action, please visit The Creative Process for Programmatic: A Guide for Marketers.